Located in the Andes Mountains, about 70 km south of Quito, the capital city of Ecuador, is Cotopaxi, a striking volcano—at once glacial and equatorial—reaching a height of nearly 6 000 m (19,500 ft). The cone rises from a large, 23 km (14 mi) base in the Ecuadorian highlands at 3 800 m (12,500 ft). Aglomerados Cotopaxi Inc., founded in 1978, manufactures lumber and engineered wood products. Sensitive from the very beginning that the raw material must be sustainable, renewable and local, COTOPAXI S.A. initially purchased a 7 000 hectare (17,000 acre) pine plantation. Since then, the company has added to its land holdings with a total of 14 000 ha. About 20% of the land base is allocated to protected areas for conservation of the native ecosystems and watersheds. 11 000 ha are planted with radiata and patula pine. The trees are topped at 14 cm diameter, skidded to a secondary deck, manually delimbed, then returned to roadside. This takes pressure off the loader and adds 50-70 tonnes to daily production. Most of the COTOPAXI S.A. land holdings are around the base of the volcano. Soil conditions are excellent with good drainage and rich nutrients, so despite the high elevation and cool year-round temperatures, rotations average 20 years with a single thinning at eight to twelve years. Sebastián Garzón, COTOPAXI S.A. engineer and head of supply, explains that the soil is very durable. Soft soil conditions and diffi culties arising from ground compaction are not significant issues for the harvesting division. The final fell mechanical harvesting operation is relatively new. Started in February 2010, it replaced a fully manual system with hand fallers, infi eld manual bucking and delimbing, manual stacking and cable skidding. Trucks were loaded with Bell three-wheelers. The new system consists of a Tigercat L870C feller buncher, a 620D skidder and a T234 loader equipped with a pull-through delimber and ground saw slasher. The L870C buncher is equipped with a 110 degree wrist and a 5702 head. The machine is currently utilized for only four to six hours per day and stays ahead of the rest of the system by a three day margin. Rodolfo Almache, the feller buncher operator, also acts as crew supervisor. His additional responsibilities involve looking after the needs of the crew members, auditing log quality and measurements, and planning the next harvest block. In future, as the industry capacity grows, the plan is to improve the balance of the system by adding skidding and processing capacity so that the buncher can be more fully utilized. The 620D skidder operates on a schedule of two eight-hour shifts per day and averages 300 m skid distances but it is the merchandising and loading function that is taxed the most. One 620D skidder works two eight-hour shifts per day. The radiata does not grow very tall, especially in proportion to its diameter and is extremely limby with the branches starting right at the base of the tree. 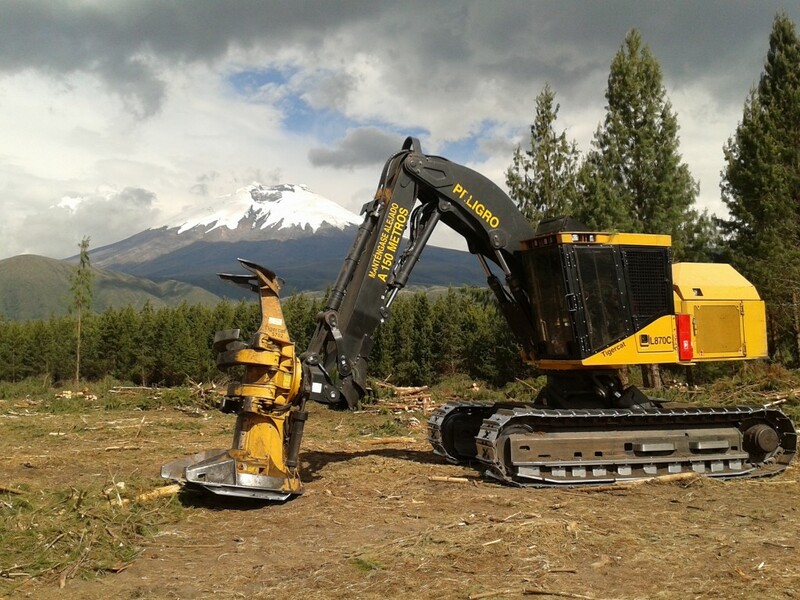 In 2009, during the period in which the COTOPAXI S.A. harvesting operations team was researching different mechanized harvesting models, Federico Arteta, executive director, and Jorge Carrasco, submanager of forestry supply, visited some plantation operations in Georgia with Juan Manual Durini, general manager of Efocol, the Tigercat dealer for Ecuador. It was there that they saw firsthand the pull through delimber and slasher merchandising model working. Although the tree profi le in southern US plantations is quite different than the radiata growing in the highlands of Ecuador (mature trees are generally taller with very few branches in the US south), this is the system that COTOPAXI S.A. settled on. To compensate for the added difficulties resulting from the high branch count, a couple of adjustments were made. First off, the bottom two metres of the tree are manually pruned. Another adjustment was made at the opposite end of the tree and the process. It was observed that the loader was spending too much time trying to remove the last few branches from the top of the tree. To compensate, the operator no longer delimbs all the way to the top of the tree. He tops the trees to 14 cm (5.5 in) diameter with the ground saw slasher and stacks the tops. The skidder takes the tops back to a secondary deck during the return trip into the cut block. The tops are manually debranched and the logs are then shuttled back to roadside, finally making their way into the particle board sort. This adjustment has reduced the drag on the loader function and added 50–70 tonnes to overall daily production. COTOPAXI S.A. has three main fi nished products. The sawmill accepts 2,18 and 2,55 m logs and multiples to 7,3 m. The MDF board plant accepts logs from 1,80–2,55 m. The particle board line accepts lengths from 1,10–2,60 m. Tolerances for branch removal are very strict for the saw logs and MDF logs, less so for the particle board logs. The resulting number of sorts plus the tough delimbing duty cycle warrant two eight-hour loader shifts. Current daily clear fell production is pegged at 250 tonnes per day. In addition to the mechanized clear fell side is a manual thinning crew, focused around a new Tigercat 604C cable skidder. The trees are hand falled manually and bucked, limbed and stacked manually infield. The 604C hauls the short wood bundles to roadside where a Bell three-wheel loader loads trucks. With careful planning, the harvesting department attempts to keep the thinning and clear fell crews close together so they can borrow equipment from one another if necessary. There is no operator redundancy because the crew members are cross-trained to work on different machines if required. The delimbing function is severe duty on account of the heavily limbed radiata pine. COTOPAXI S.A., which also undertakes site prep and planting, has been working to improve stand quality. Whereas in previous years operations were focused on the lower quality legacy stands and the ratio of clear felling to thinning was very high, these days as the stands continue to improve, there has been much more thinning activity—averaging 600 ha (1,500 ac) per year. When the thinning crew is operating, daily production is about 160 m³. Henry Cuichan, who completed a fifteen day training program at the Tigercat factory, is in charge of maintenance for all Tigercat machines. He handles all daily maintenance and small scale repairs. Efocol’s technical manager Santiago Neira works with Henry on larger issues. The COTOPAXI S.A. harvesting team. Mechanization has increased the employee skill level, improved productivity and reduced workplace injuries. Sebastián explains with pride that the company has worked hard to improve safety on the job through mechanization and by moving people on the ground to safer jobs. This shift has occurred without reducing the workforce. The new system has greatly improved productivity while improving safety and reducing the incidence of workplace injuries.